We are spending a few days at one of our membership parks in White Cloud, MI to help justify buying the membership in the first place. Grand Rapids is reasonably close and this gave us the opportunity to take in a couple of sights we have wanted to get too and to visit one of Anneke’s favorite stores-specializing in imported Dutch goods. The Gerald Ford Museum is located in downtown Grand Rapids, which was President Ford’s boyhood and where he started his political career. The museum is very nicely done and covers his complete political and personal life. For those of you who may be too young to remember, he served for 25 years as a congressman from Michigan before being appointed to replace the disgraced Vice President Agnew under President Nixon. Of course, not much later he found himself replacing President Nixon, who resigned over the infamous Watergate scandal. He became both Vice President and President without having ever been elected to either position. His service as president was short, two and a half years, as he did not get elected when he ran his first presidential campaign against Jimmy Carter. It is generally held that his pardon of Nixon did him in. What a pity, as President Carter nearly bankrupted the government single handed. But never fear, we have another democrat in office that looks like he will be able to finish the job. One of the best parts of the museum is a full scale model of the oval office. President Ford is laid to rest just outside the museum in a very understated garden. It reflects his simple and honest style. We next visited the surprisingly large Public Museum of Grand Rapids, which not surprisingly covers the history of the city from before the white settlers through the current period. There are a lot of interactive displays for kids, a model turn of the century town and a great deal of history about its biggest industry-furniture. Well, worth the visit. Finally, we hit the Vander Veen’s Dutch store; well know among the expats, where we stocked up on those hard to find goodies. Petoskey sits on the shores of Lake Michigan about midway between the Strait of Mackinac and Traverse City. It has been a resort area for many years and remains a popular destination. We came here principally to visit a nearly new Signature Motorcoach resort. This one had belonged to Monaco RV Company before it went into bankruptcy. It is now complete and looking for owners and visitors to get things going. This type of RV resort is the opposite experience than what we discussed in our write up of the experience in the Tahquamenon Falls State Park. 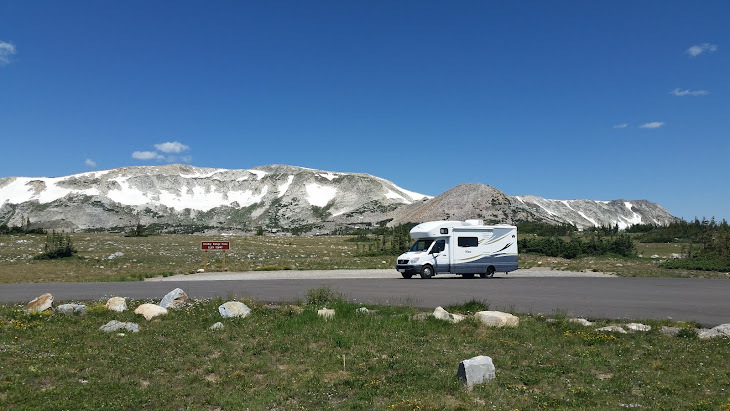 This is a park restricted to only motorhomes over 30 feet and less than 10 years old. No tents or campfires allowed. The grounds are indeed impressive with large sites and well groomed landscaping, new club house, pool, exercise room, billiards, Movie Theater, real 9 hole putting course and so on. What was missing were the coaches. There were only a few of us there on this weekend and it was a bit lonely. We explored the area and shopping hot spots, but the rather sad highlight was being witness to the lost of a small sailboat. On our way back from dinner, we noticed a small sailboat that seemed to be in trouble near a marina in Bay Harbor, MI. We found our way to a spot where we could park and walk out near the boat. It was hanging on a mooring line apparently caught in some rocks. The wind and surf was quite rough and folks who had been there awhile, including what later turned out to be the boat owner, said it had broken loose from a mooring sometime earlier. There was not anything to be done but watch it roll in the surf. For some reason the hatches were open and every time it took a big roll more water poured into the hull. It was soon apparent the end was near, and suddenly she took a big hit from a set of incoming waves and rolled on her side and sank. Worst of all was the fact that I did not have a camera with me. We have a rule that a camera is always with us. This time we failed to have it. We checked back in the morning in time to watch the recovery of the wreck over the beach. Definitely a total lost. The Soo Locks in Sault Ste. Marie, MI are a vital link in the Great Lakes Marine Navigation system. These locks connect Lake Superior to the rest of the Great Lakes. 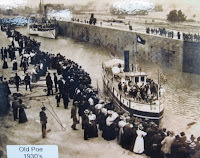 The first lock was completed in 1855 around the rapids that were restricting commercial marine traffic. In the 1870’s, these locks were placed under the control of the federal government and currently are managed by the US Army Corp of engineers. The locks are capable of handling the largest ships on the lakes- the 1000’ bulk freighters. There are two active locks with plans for the two smaller locks to be replaced when funding is available. We are camped at the water’s edge just a short distance east of the locks and can view the ships as they come and go thru the locks. The lock grounds are open to the public, where you can view the ships as they transit the locks. A visitor center is on the grounds which explains the history of the locks and keeps visitors updated on expected arrivals. A web cam system is in place on the locks and you check the activity at locks 24 hours a day. If you are in the area, this is definitely worth the visit and it is free. Tahquamenon Falls State Park contains almost 40,000 acres, most of which is woodland with no developments. The main attraction of the park, and the reason for its existence, is the Tahquamenon River with its waterfalls. This is one of the largest waterfalls east of the Mississippi. It has a drop of nearly 50 feet and is more than 200 feet across. At its peak, up to 50,000 gallons of water per second flows over these falls. Downstream there are several smaller falls referred to as the lower falls and these have a small Island between them. You can reach the island by a small boat that can be rented from a concession stand. For the hiker there is a trail between the falls that is four miles in length, one way. This area inspired Longfellow's Hiawatha - "by the rushing Tahquamenaw". Long before the white man arrived, the abundance of game along its shores brought the Ojibwa Indians to the area, who camped, farmed, fished and trapped along its banks. In the late 1800's came the white man in search of the lumber and the river carried their logs by the millions to the mills. These lumberjacks were among the first permanent white settlers in the area. The color of the water in the river is said to be from the natural materials in the runoff from the forests surrounding them and the water is very soft, resulting in the foaming seen as it runs over the falls. Whatever the reason, the falls are wonderful to look at. We walked both sets of falls and took the boat ride to the island for more scenic views. Camping in this state park has reminded us of the good old days of real camping, as opposed to RVing. The park is filled with tents and pop up campers, campfires burning day and night and adults and children out and about having fun. Smoke fills the air for at least 18 hours a day. We met two Coast Guard couples while here. One of them is the current commanding officer of the new cutter Mackinaw. The largest of the Great Lakes ice breaker fleet. We spent hours around a campfire talking about Coast Guard stuff. Something I have not done in quite awhile.